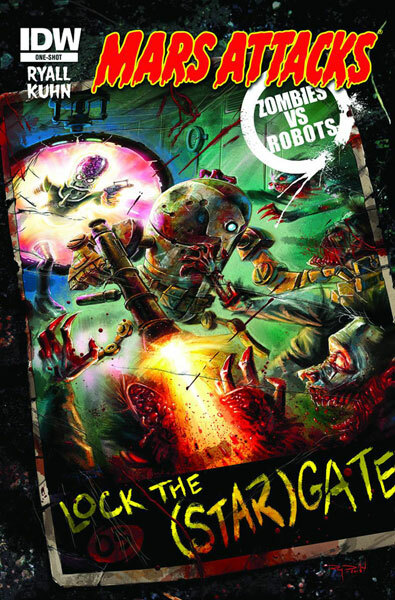 The Fellowship was fortunate enough to obtain a copy of MARS ATTACKS ZOMBIES VS ROBOTS from IDW Publishing. Chris Ryall writes, and Andy Kuhn draws. The Martians have found a stargate hidden in a military base on Earth. Perfect for a new invasion, right? Only there’s no one to be found, at least until they find the zombie horde. And when the robots show up to clean up, the Martians realize that things are not as they seem. I admit I have been a little suspicious about the Mars Attacks “crossovers” I’ve seen out there, but when I saw this one I had to check it out. And it was totally worth it; this book is great fun. Ryall’s robots are vicious killing machines, but they aren’t nearly as stupid as these Martians think they are. I love that the machines are more interesting characters than the aliens, and that the zombies even show a little (sort of). If you’re into mindless violence and mayhem, pick up this book. If you’re not, pick it up anyway; there’s enough cleverness to make it worth your while. MARS ATTACKS ZOMBIES VS ROBOTS is available now at your FLCS or by order from idwpublishing.com.